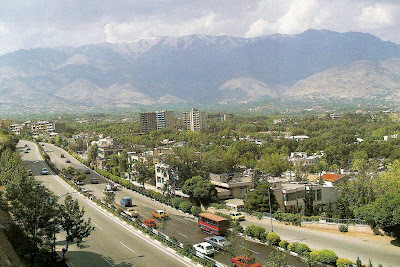 Looks like Vancouver or maybe the Seattle area, but this is actually Tehran. Looks the same as your home town, doesn't it? Belief: Iran is aggressive and has threatened to attack Israel, its neighbors or the US. Belief: Isn't the Iranian regime irrational and crazed, so that a doctrine of mutually assured destruction just would not work with them? Actuality: The centrifuge technology that Iran is using to enrich uranium is open-ended. In the old days, you could tell which countries might want a nuclear bomb by whether they were building light water reactors (unsuitable for bomb-making) or heavy-water reactors (could be used to make a bomb). But with centrifuges, once you can enrich to 5% to fuel a civilian reactor, you could theoretically feed the material back through many times and enrich to 90% for a bomb. However, as long as centrifuge plants are being actively inspected, they cannot be used to make a bomb. The two danger signals would be if Iran threw out the inspectors or if it found a way to create a secret facility. The latter task would be extremely difficult, however, as demonstrated by the CIA's discovery of the Qom facility construction in 2006 from satellite photos. Nuclear installations, especially centrifuge ones, consume a great deal of water, construction materiel, and so forth, so that constructing one in secret is a tall order. In any case, you can't attack and destroy a country because you have an intuition that they might be doing something illegal. You need some kind of proof. Moreover, Israel, Pakistan and India are all much worse citizens of the globe than Iran, since they refused to sign the NPT and then went for broke to get a bomb; and nothing at all has been done to any of them by the UNSC. Afghanistan : Tom Friedman's 'Cronkite Moment'? Austin Economy : We're Number 2! Maybe. Northwest Pilot Show : Dreamliner Bedtime Story? St. Pete : Free Speech or a Senior Moment? Austin : Billionaires for Wealthcare! Climate Bill : Morphing into a Monster? Afghani Olympics : Will Obama Lose This One Too? Roman Holiday : Fatty, Woody and Polanski, Oh My! Iran's Covert Nuke Sites : How Many Are There?